Religious sectarian tensions are reaching record levels in post-Gaddafi Libya, with two Sufi religious sites attacked and destroyed in just two days by Salafi activists. ­An armed group of people including government security personnel have bulldozed the Al-Shaab Al-Dahman mosque, containing many graves, in the center of Tripoli on Saturday over allegations that a Sufi Muslim sect has been engaging in “black magic”. 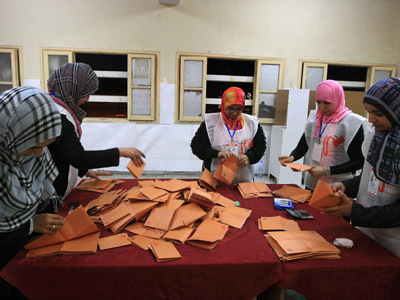 Libya’s government has condemned the attack and also voiced concern at the authorities’ involvement in the demolition. "What is truly regrettable and suspicious is that some of those who took part in these destructive activities are supposed to be members of the security forces and from the revolutionaries,” the president of Libya's newly-elected National Congress, Mohamed al-Magariaf, told reporters. It is unclear how many security forces personnel were involved in the bulldozing. Authorities tried to stop the demolition, but after a small clash with the armed group, the police decided to cordon off the area while the destruction took place to prevent any violence erupting. 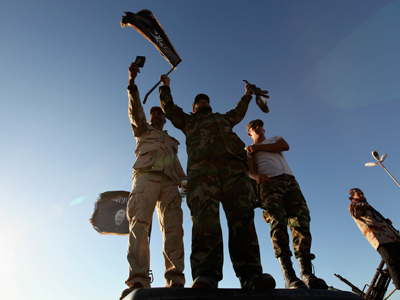 "A large number of armed militias carrying medium and heavy weapons arrived at the al-Sha'ab mosque with the intention of destroying the mosque because they believe graves are anti-Islamic," an anonymous government official told Reuters. Reuters also has information that the Interior Ministry allegedly gave the green light to the bulldozing "after discovering people had been worshipping the graves and practicing 'black magic'". Tripoli’s Al-Shaab Al-Dahman mosque contained around 50 Sufi graves, including the tombs of Libyan Sufi scholar Abdullah al-Sha'ab and of soldiers who fought Spanish colonialists. Mohamed al-Magariaf called the Prime Minister to an emergency meeting on Sunday and slammed the Interior Minister Fawzi Abdel A’al for a general lack of security in the country. The attack on the mosque comes on the back of a similar incident in Zlitan and a double car bombing that killed two people in Tripoli a week ago. The criticism did not go down well with the Interior Minister. In protest to the rebuke, he tendered his resignation. Friday saw another attack on Sufi worship sites in the city of Zlitan. Ultra-conservative Islamists destroyed the tomb of a 15th-century Sufi scholar and set the Mosque’s library on fire. The vandals bulldozed the grave of Abdel Salam al-Asmar and set a historic library in a neighboring mosque ablaze, according to witnesses. 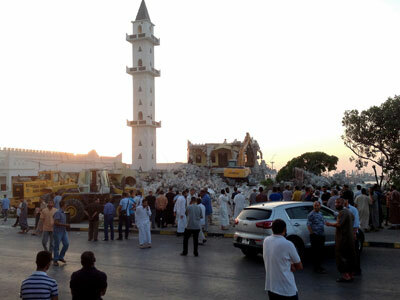 The structure’s dome collapsed and a minaret was pitted with holes. "We are distraught at the destruction of this historical and spiritual place in Libya," said Mohamed Salem, caretaker of the mosque. Meanwhile, a Facebook page called "Together for the Removal of the Abdel Salam al-Asmar Shrine" praised supporters on the "successful removal of the Asmar shrine, the largest sign of idolatry in Libya." 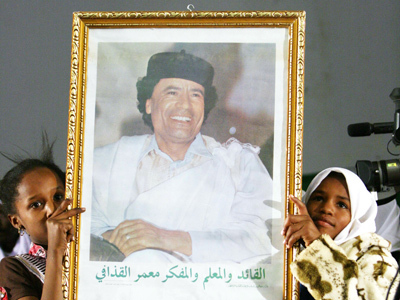 Following the ousting of Colonel Gaddafi, cultural clashes between followers of the mystical Sufi tradition and ultra-conservative Salafis have taken central stage in the new Libya. Sufism is a mystical sect of Islam which includes dancing and building of shrines to venerated figures. Followers make pilgrimages to them. 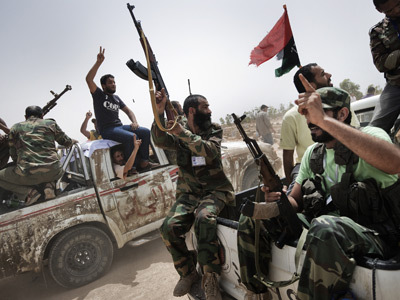 As Libyan authorities struggle to control countless armed rings that refuse to surrender weapons following last year’s civil war, Salafis, who say Islam should return to the simple ways followed by Mohammed, have established a number of armed gangs in post-Gaddafi Libya. They view Sufi practices as idolatrous. 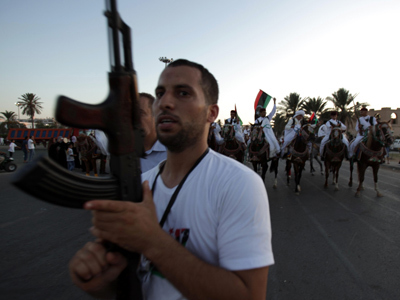 Since the start of the Arab Spring uprising across the region, a number of Sufi sites have been attacked in Egypt, Mali and Libya.